A gate remote Studio City service refers to providing, programming and repairing the mobile devices which allow people to control the movement of a gate from a distance, by means of sensors. 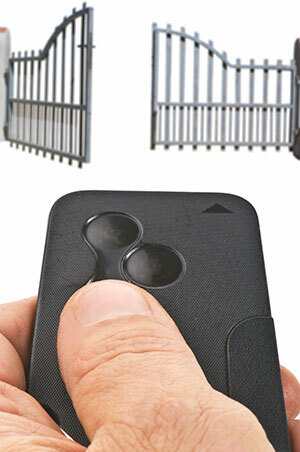 A company like our, offering gate remote Studio City services, also deal with any issue or aspect connected to automatic gate systems. With time, these have gotten to be complex, because brands invented more and more ways to achieve functionality and security, with a care for design as well. Control panels, wall buttons, sensors and remotes are all related to the latest features that clients enjoy. However, the aforementioned progress also led to newer issues. A mechanical error is easier to spot usually, but what can one do when a gate remote stops working? To go buy a new one to replace it may not be a good idea, because stores don't always sell the exact same brands and you could end up with an incompatible remote. Don't let a broken gate clicker stand in your way and cause bigger troubles. Also, do not rush to set a verdict. The best course of action is to call for specialized staff who can come right away to inspect the matter. Perhaps the remote was abused and thus stopped working, or the problem lies in the sensor. Also, malfunction may be caused by an error in programming – in this case, the gate remote program has to be renewed. This task is a simple one for our technicians, once you inform them about how you want your automated system to behave. Incompatibility is no longer a matter to worry about. All the major brands are in stock, therefore we can solve the problem within the same day, in one visit. Our services are for both driveway and garage gates. A Multicode remote, as all the Linear remote types, has a very good range, a convenient small size and easy to action buttons. Also, we can provide an Allstar remote or a Carper one. When your gate remote functions in an intermittent manner or it completely stopped working, it may also be from a cause that's not too easy to spot: radio and TV transmitters around can interfere with the signal and render the receiver unresponsive. If you live in the vicinity of such high powered transmitter, consider this when trying to fix a remote or planning to purchase a new one. However, you don't have to move away to escape this problem. It is enough to contact a technician – he will tune your gate clicker to a higher or lower frequency, so that it stops interfering. The receiver also has to be tuned. There is much more about our company, than just the gate remote Studio City advantageous services. We can help you get a custom-built gate plus fence, investigate all parts of a system and perform repairs on openers, tracks, rollers, locks, gate motor, springs of all types and so on. Basically, each aspect is covered, so that you can save time and money by allowing one single company to do these things for you. One of the best parts is that we are quick to respond and therefore very efficient when you face an emergency. Intervention within a short time span is one our most appreciated services.